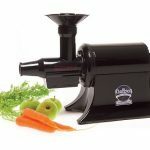 Do you want a durable multi-purpose juicer that you can use to juice fruits, vegetables and other leafy greens? 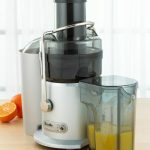 Do you have a tight budget that’s preventing you from investing in an expensive juicer? If so, we suggest that you consider the Breville RM-JE98XL Certified Remanufactured Juice Fountain. The Breville RM-JE98XL Certified Remanufactured Juice Fountain has the same features of the original RM-JE98XL. The only difference is it’s remanufactured. It runs on 850 watts of power and features a dual speed motor that enables you to adjust speeds and extract maximum amount of juice possible from soft produce as well as hard produce. Let’s begin this Breville RM-JE98XL Fountain Plus Review with it’s features, followed by its pros and cons. – This Breville RM-JE98XL is a certified remanufactured model from Breville. Breville has a remanufacturing program where each of its failed products or old products are broken down into individual units and reconstructed again depending on their condition. Each of these units is tested thoroughly for errors in different areas. The source of error is eliminated before the model is rebuilt. This isn’t like other remanufactured products. The model comes certified by Breville backed by a limited 90 day warranty on the model. – The Dual Speed (6,500 RPMs and 12,000 RPMs) 850 watt motor ensures efficient juicing of all kinds of fruits and vegetables. Harder produce requires a higher RPM motor to ensure maximum extraction of juice as fast as possible whereas softer produce requires a lower speed motor to ensure maximum extraction of juice. You can adjust from either speed depending on the type of produce. – Another feature that makes the Breville RM-JE98XL stand out is its extra wide feeder chute. 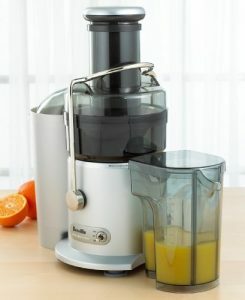 Most juicers have feeder chutes that vary from 1.5 inches to 2.5 inches. The Breville RM-JE98XL has a 3 inch feeder chute. This enables you to feed large fruits like apples, tomatoes and oranges without having to chop them down into tinier pieces thereby saving you time and effort. 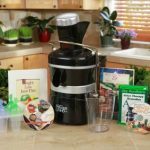 – A juicer’s worth is also determined depending on how easy it is to clean. Cleaning is extremely easy with the Breville RM-JE98XL Fountain Plus. Almost all parts in this juicer are safe to be washed on a dishwasher. There are some parts that require to be cleaned manually which only take a couple of minutes to do so. You’ll never be frustrated by the cleaning process with the Breville RM-JE98XL. 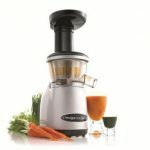 – While the Breville RM-JE98XL can certainly juice most fruits and vegetables extremely well, it’s not effective when it comes to juicing leafy greens and soft vegetables. 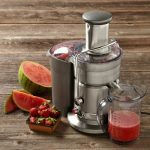 If you’re interested in juicing leafy greens and other softer fruits, we recommend that you consider a masticating juicer. If you’re on a limited budget and looking for an efficient juicer that will enable you and your family to enjoy fresh juice at home, we strongly recommend that you go ahead with your purchase of the Breville RM-JE98XL Certified Remanufactured Juice Fountain Plus.